In this mixture, a pure lavender essential oil is blended with all-natural resins, aromatic herbs, and other essential oils and spices. This formula was created carefully in accordance to ancient wisdom to stimulate and open the Manipura Chakra. 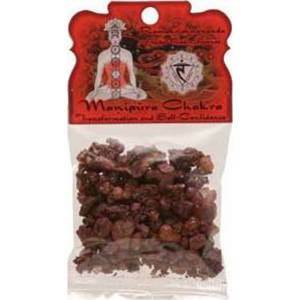 Continued use of this incense helps the chakra to function in a healthy manner, and also promotes self-confidence, vitality, the ability to make changes in one's life, and contributes to healthy digestion. The Manipura Chakra is the third chakra and is situated near the navel. It is the energetic center that relates to the fire element. Prabhuji explains that when this center is open, one experiences improved self-esteem, confidence, the feeling of lightness, enthusiasm, self-assurance, and the capacity to both accept and execute authority. Healthy functioning of the chakra also improves one's dynamism, motivation, persistence, trust, ability and power to make changes in life, and promotes healthy digestion. Made U.S.A.